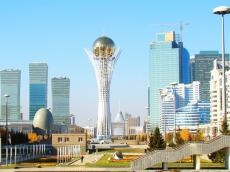 Kazakhstan's President Nursultan Nazarbayev has brought into service the stock exchange of the “Astana” International Financial Center (AIFC), the Kazakh media reported. "I congratulate you on the fact that this long-awaited minute has come, and our international financial center is working now. Our country is just 27 years old. This is a moment for history. However, I think that our people have taken a big step towards future prosperity. We very much hope that the AIFC will also serve this purpose," the head of state said at the opening ceremony of the AIFC. Astana International Financial Centre is the financial hub for Central Asia, South Caucasus, the Eurasian Economic Union, the Middle East, Western China, Mongolia and Europe. AIFC will be situated on the territory of EXPO-2017 and will use modern infrastructure and advanced technologies. The main activities of AIFC are the development of the capital market, asset management, asset management of wealthy individuals, Islamic finance, and new financial technologies.